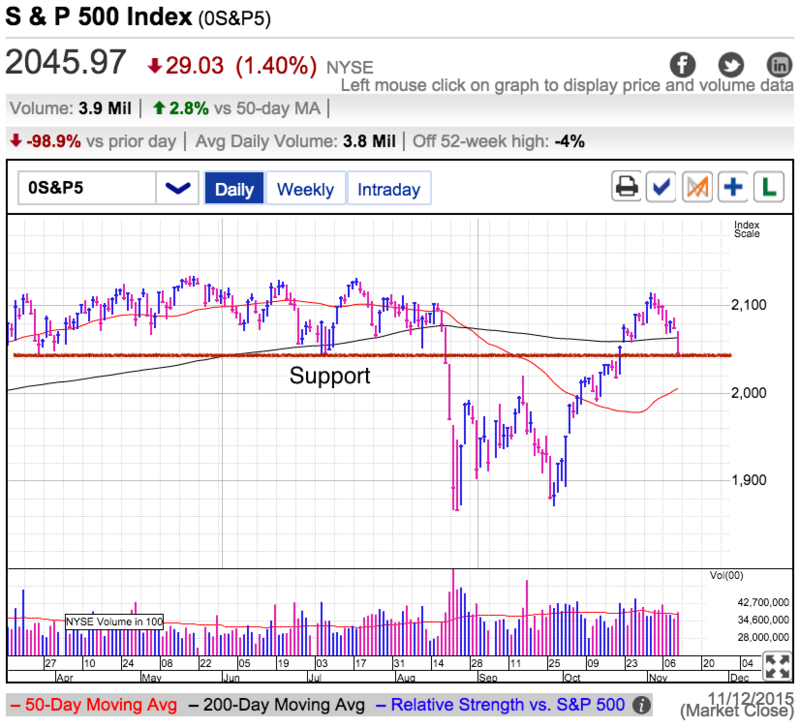 It was a dramatic day for the S&P500 in this holiday shortened week. A NATO nation intentionally shot down a Russian fighter jet and fears of a military escalation sent traders scrambling for cover. European markets plunged 2% on the news and the selling spilled over to US markets when we opened. But by midmorning the reactive selling stalled and we found support at 2,070. Not only did the market find a bottom, but by the close we recovered all the losses and finished in the green. Without a doubt this counterintuitive price-action left a lot of bears scratching their heads. Russia is clearly upset about what happened and the world is anxious to see what happens next. Realistically Putin only has two options, retaliate or complain. While a military escalation between Russia and the West is terrifying to contemplate, Russia would suffer tremendously if he chose this route. Putin is most definitely a bully, but he is not a madman. He has little to gain from a direct confrontation with NATO and everything to lose. Inflammatory rhetoric is the only sensible tool for him to wield because he cannot afford to do any more. Maybe he could withhold oil and natural gas, but even that is cutting off his nose to spite his face because this would do far more damage to the Russian economy than Europe. Traders waking up to this realization is what allowed us to recover from those early, reactive losses. Since this is a holiday week, most big-money, institutional investors are on vacation. Without their guiding hand, we often see increased volatility as smaller and more impulsive traders take over. Had these events occurred during a more typical week, most likely we would not have fallen as far since cool-headed money managers would have snapped up the irrationally discounted stocks. Without big money’s help this morning, the only thing that saved us was running out of sellers. The thing that kept these losses relatively modest was the fact that we’ve seen a tremendous amount of turnover through the last few months. August’s plunge purged most of the weak-kneed owners and replaced them with far more confident dip-buyers. Anyone who bought the fear and uncertainty over the last few months clearly has thick skin and they demonstrated that again today by not reacting to this mornings headlines. While most people are confused by the market’s reaction today, if you understand the underlying factors, this modest dip and decisive rebound make perfect sense. As for how to trade this, it is hard to get more bullish than this type of response to bad news. If we won’t sell off on falling energy prices, slowing global growth, a surging dollar, disappointing earnings, rate-hikes, terrorism, and now military conflict with Russia, it is hard to imagine a scenario that will scare these confident owners into selling. Bearish headlines don’t matter if no one sells them. Given this environment, plan on another Santa Claus rally this December. Wednesday produced the second 1.5% up-day this week as the S&P500 launched through 200dma resistance. The headline catalyst was Fed releasing their monthly meeting minutes. While the crowd assumed the market needs never ending easy money to keep this rally rolling, today we surged on the strongest hints yet of an imminent rate hike. Has the market lost its mind? Or is the crowd looking at this the wrong way? Something that trips up a lot of traders is they assume there must be a reason behind every price move. Why did we drop last week? What made us go up today? The financial media lives off of this hunger for explanations. And just like everyone else in the market, rather than admit they don’t know the answer, journalists will gladly make something up. We expect them to give us reasons, not say “I don’t know”. They claim we rallied today because of the Fed meeting minutes. Had we sold off instead, no doubt they would have just as effortlessly spun the same data into a bearish tale. I’m not being critical of journalists because they are giving us what we ask of them. Filling our needs isn’t their fault. The problem lies with us and always needing a reason. Armed with this “information”, traders further compound the problem by assuming every small move is the start of something larger. We like to draw long trend lines from small data sets. 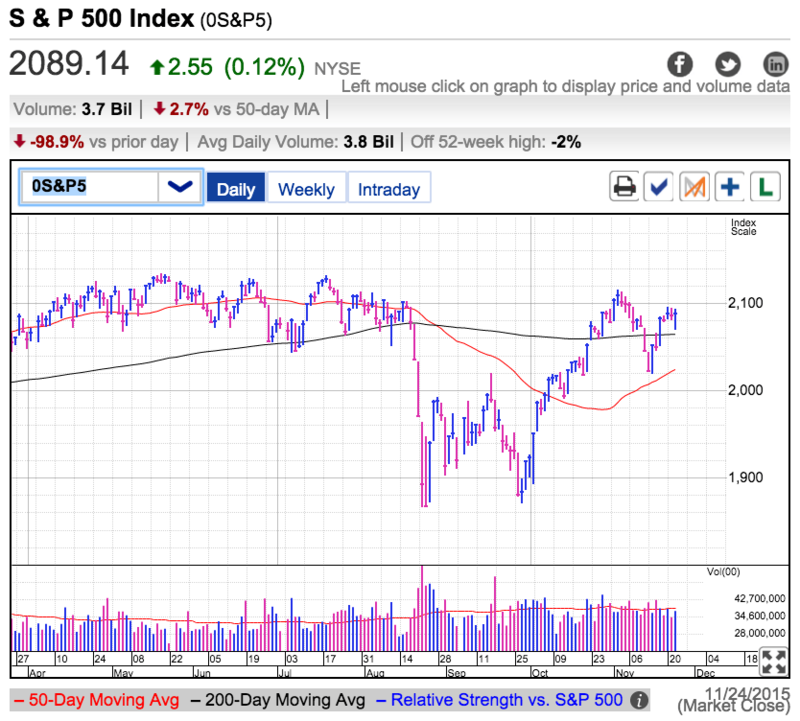 Last week’s 90-point pullback was the start of a 300-point plunge through 2015’s lows. At least that is what it felt like Friday. But that’s not what happened. Instead we find ourselves up nearly 70-points and the week is barely half over. What happened? Everyone knows markets go up and down. They know we take a step-back for every two-steps forward. We all know it is better to buy stocks when they are cheap and sell them when they are expensive. Anyone can look at the middle of a chart and identify the obvious tops and buy-points. But once our eyes drift to the far right edge of the page, we forget everything we know. All of a sudden a very routine and buyable dip transforms into a terrifying cliff. Or a big runup feels like safe and comfortable place to buy instead of a what it really is, the last chance to take cover before the storm. While I had no idea what the headlines would be, in my November 5th blog post I warned readers that we were setting up for a very normal and healthy pullback following a 200-point rebound from the October lows. Then in my November 12th blog post I said this was the pullback we were waiting for so instead of run scared, take advantage of the discounts. After the fact these seem like brilliant calls, but that is grossly overstating the amount of brain power it takes to see these moves for what they are, simple swings in supply and demand. We sell when the crowd is buying and buy when the crowd is selling. It doesn’t get much easier than that. Rather than get freaked out by the headlines and the far right edge of the chart, remember what you already know. It only takes a moment to find the obvious answer if we clear our mind of all the noise. Who is the Next Buyer? The S&P500 slipped modestly Thursday, but this was mostly a placeholder day ahead of Friday’s monthly employment report. 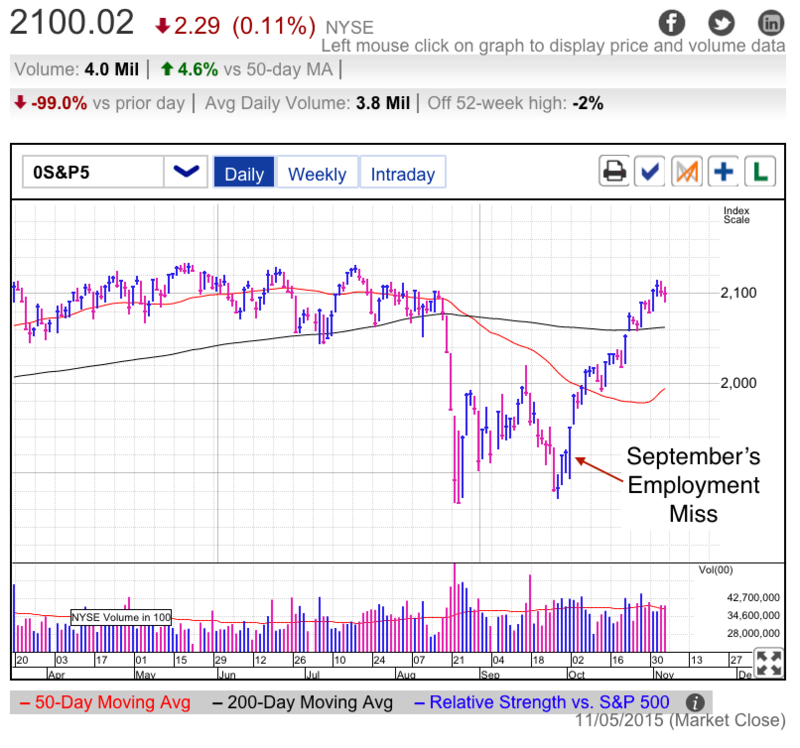 October’s breathtaking 200-point rally kicked into overdrive following September’s big employment miss. Will October’s employment launch a similarly impressive move? I cannot begin to guess what the jobs number will be. Maybe we have another big miss. Or maybe economists lowered their expectations so much that it will be an easy beat. But the truth is even if I knew the number ahead of time, I’d still be clueless about how the market will react to it. We vacillate so frequently between ‘good is good’ and ‘good is bad’ that it is challenging to simply figure out which way is up. But rather than guess what the number will be or how the market will react to it, there is a better way. Everything always comes back to supply and demand. It makes no difference why people are buying, only that they are buying. Same goes for selling. This means we no longer need to worry ourselves over whether ‘good’ is good or bad. The only thing we care about is if people are buying or selling the news. So the question of the day is, “Who is the next buyer?” Find that answer and we unlock the market’s next big move. To figure out where we’re going, we start with where we came from. Two-hundred points over four-weeks tells us there was a lot of desperate buying in October. Buyers were forced to offer higher and higher prices in order to persuade reluctant owners to sell. Value buying, dip-buying, short-covering, breakout buying, and good old fashioned chasing, we saw it all in October. And that’s what launched us from the lowest levels of the year to near record highs almost overnight. As for what comes next, we need to identify that next enthusiastic buyer. Near record highs, we can cross value buyers off the list. Same goes for dip-buyers. If there are any shorts left in the market following a 200-point beating, clearly they don’t feel pain and any further gains are just as unlikely to convince them to cover. We smashed through almost every resistance level and moving average on our way higher. The only meaningful level we haven’t crossed is all-time highs above 2,130. But again, if a breakout buyer didn’t buy the previous key levels, is 2,130 really going to get them off the couch? The one plausible category left is the chaser and given all the selling we saw in September, there are plenty of regretful sellers afraid of being left behind. But while a retail trader might buy after a 200-point rebound, institutional investors are far more stubborn. They are experienced enough to know a pullback is just around the corner and will patiently wait for a hot market to cool off. And so here we are. I have no idea what the employment number will be or how the market will react to it. But I know that no matter what the knee-jerk reaction is, it is going to be really hard to find new buyers to keep these sharp price gains going. Keep that in mind as you try to figure out how to trade Friday’s employment report. 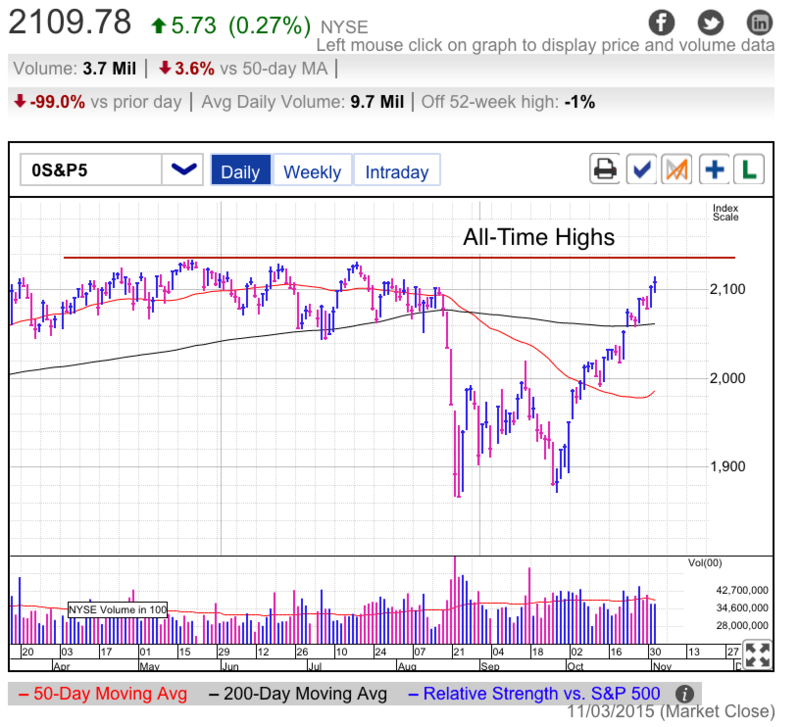 The S&P500 dipped under 2,100 support in early trade, but the selling quickly stalled and we rebounded to three-month highs. Head-fake moves like these show the risks of triggering trades solely based on obvious technical levels. No doubt a lot of bears were sucked into selling this morning’s dip, only to see it blow up in their face hours later. It’s been a great ride for anyone who held the rebound. Rather than defensively sell the recovery, these owners are gleefully holding on for larger gains. The lingering concern that makes me question a return to all-time highs is we still haven’t resolved the global growth problem that triggered August’s selloff. We often see binary outcomes in politics. Did Congress pass the budget? Did the gov’t shutdown? Did Greece accept the bailout? Did the West respond militarily to the Russian occupation in Ukraine? Politically caused situations can be fixed overnight and this immediate resolution justifies prices returning to previous levels. But economies are far too large to turn on a dime. The late summer selloff was driven by slumping commodity prices, a strong dollar, and declining overseas consumption. These factors are just as real today as they were two months ago and will still impose a measurable impact on our economy. While I disagree with the bears that these factors will cripple our economy and send us into a deep recession, they are real headwinds that will weigh on growth, employment, and earnings. August’s 10% selloff more than adequately accounted for this economic slowing and represented a great dip-buying opportunity. Once the news is priced in, it is safe to ignore the headlines. From there it should have been a slow grind higher over the next several months as we overcame these headwinds. That is the trade I was expecting. Instead we got this rocket ship from the bottom that pushed us right back to all-time highs. It doesn’t take an economics PhD to figure out that stocks should have at least a small discount to account for China and Europe slowing down. Since we don’t have a clear resolution to these global growth problems, people must be buying stocks for other reasons. First they were buying because of more easy money. Then they continued buying because everyone else was buying. Neither of these things changed our economic reality and that realization will most likely hit stocks in coming weeks. While we’ve grown drunk on the relief rally over the last month, we will eventually stumble upon a headline that reminds us the situation is not solved. Then the scramble for the exits begins all over again. The emotional selling will be less intense than August, but it will still feel like we are falling off a cliff. While I’m warning of near-term pullback, I’m actually bullish about the situation. Markets move two-steps forward and then take a step back. This is the healthy and sustainable way they climb higher. Everyone knows this, but all too often we get sucked into the myopia of hype, fear, and greed following large moves. The best profit opportunities come from buying stocks when owners are selling at a discount, not charging a premium. I don’t know when the market will take its step-back, but only a fool would expect these strong price gains to continue indefinitely. That means we must patiently wait for the all fools to finish throwing all their money at the market before gravity takes over. But rather than fear the dip, we should embrace the buying opportunity.